We spend quite a bit of time on our patio. Greyson is still at that age where he likes to play outside (on the playset) or ride a little John Deere tractor around. As a family, we love to have a fire in the fire pit and relax. It’s one of those casual family things that we can do together that can be pretty relaxing for all of us. With the new flooring that I talked about yesterday, the budget for any patio upgrades is pretty small. But, I do think I can save some pennies here and there and do a few little things. So, over the next month and a half or so, I’m going to start a little series on how to have a Patio Spruce-Up on a Budget. Want to walk down memory lane with me for a bit? The patio set we had from our last house (purchased for $75 off of Craigslist). The fountain was here, although it didn’t work. 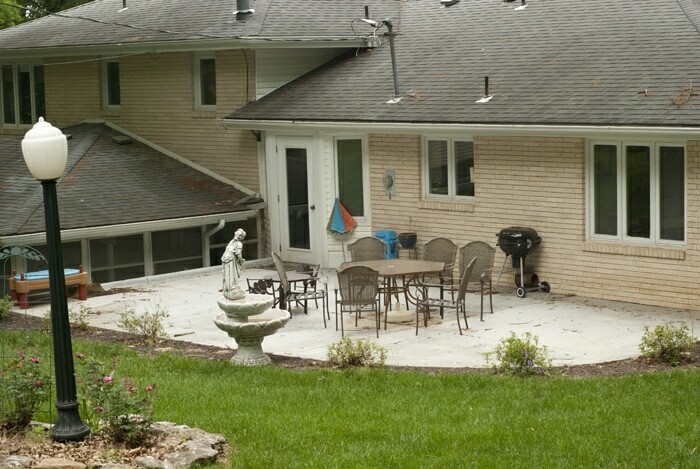 The landscaping around the patio looks better in this picture than what it did in person. We lived with it as is for a year or so. The next year, we spent a pretty penny on mulch for the front and back yard. 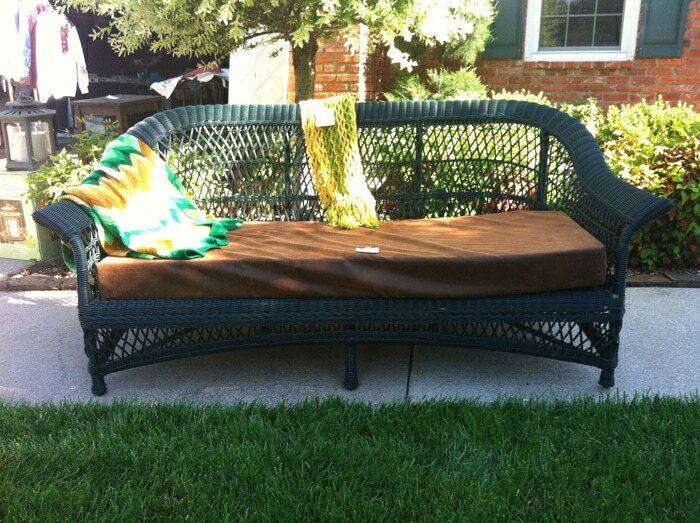 I found an outdoor sofa for $50 at a garage sale. It was in great condition other than the ugly cover on the pad. 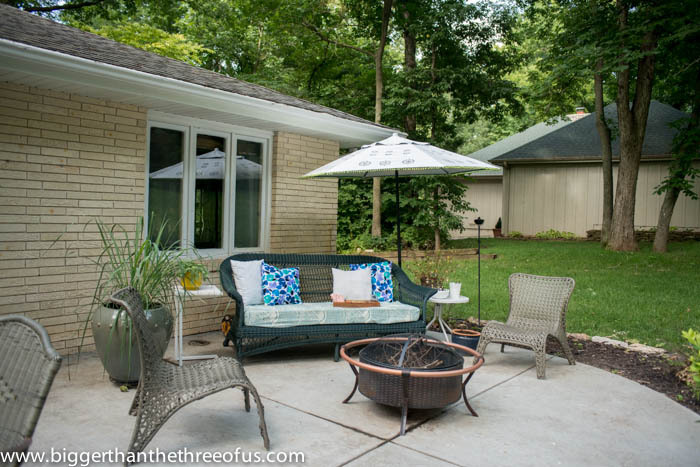 The pad got a makeover and we took it to the backyard. We bought a fire pit, two lounge chairs and new cushions. It looked pretty good and was definitely usable. The fountain didn’t work and the bushes around the patio were not the prettiest. Some were alive and some were about to kick the bucket. Overall, we made quite a bit of progress. *Affiliate links below. Read my disclosure policy. The following year, the umbrella had completely faded. We painted the umbrella and brought more mulch in. We acquired a few planter pots and a small outdoor table. We planted some inexpensive, decorative grass in one of the planter pots to help soften the space up. Last year, the umbrella got knocked over in a storm and broke. To be completely honest, we didn’t love the umbrella anyways. We LOVED the design but not how the umbrella operated. It was a cheap umbrella that raised up and down but didn’t tilt. 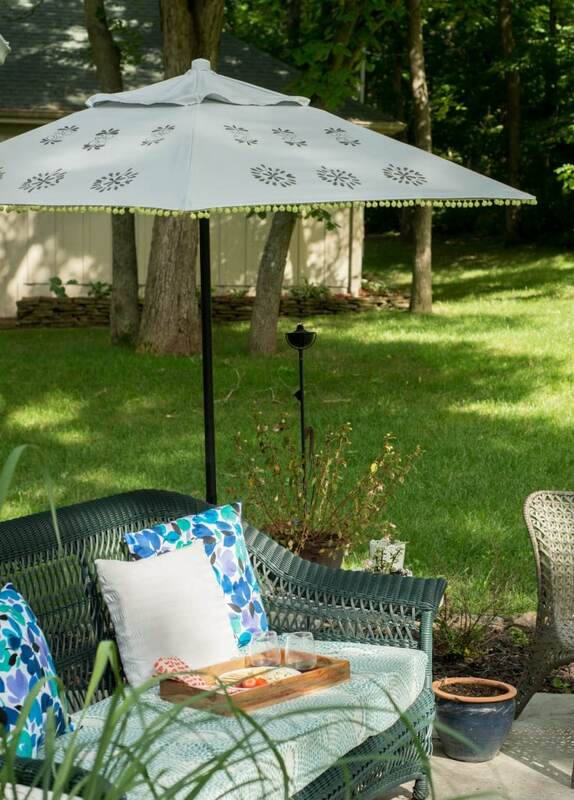 We have a large tree in the backyard that provides pretty good shade on the patio, so we hardly used the umbrella. If we had a tilt one, we could definitely use it as the sun goes down because that’s where we are lacking for shade. I’d buy this tilt umbrella if I was buying one. 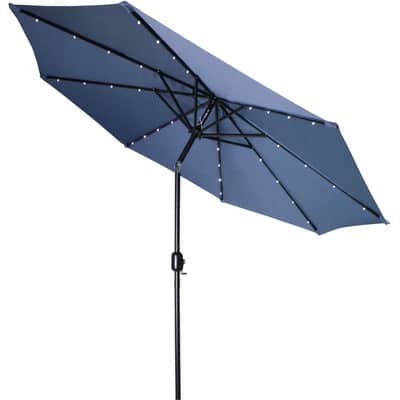 It’s under $100, comes in a few colors, gets great reviews and has lights. But, the umbrella isn’t in the cards this year. So, at the end of the summer last year we didn’t have an umbrella but I did do make a small update to the space. I got rid of the ugly fire pit cover and made a DIY fire pit topper. It totally helped the space feel more cohesive and pretty all the time, not just when I brought all the cushions out. I’ll be back next week with the second installment of the patio spruce-up on a budget. 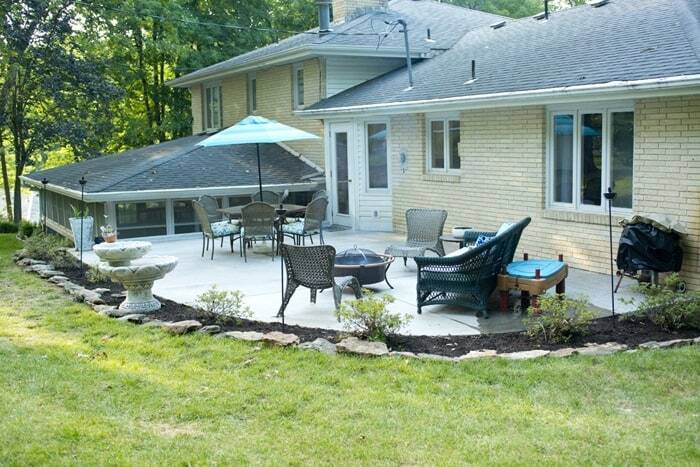 What are your patio/backyard plans for this year?